Dozens of pro-Palestinian campaigners brought growing anger over Israel hosting this year’s European under-21 football finals right to UEFA’s door on Friday (January 25), forcing the organisation’s president Michel Platini to grant them a hearing at his headquarters in Nyon , Switzerland. Platini had previously spurned calls from sources as diverse as the president of the Palestinian Football Association, internationally renowned film-maker Ken Loach and a list of more than 50 football stars including Frederic Kanoute and Didier Drogba, not to reward Israel for its flouting of Palestinian human rights. On Friday he gave the first hint that he was listening to the protests, saying in a televised news conference after a meeting of UEFA’s Executive Committee that he would “think about it and take a decision in the current year”. Olivia Zemor of French campaign group Euro-Palestine, leading the activists who crowded into UEFA’s reception area in Nyon, charged Platini with ignoring Israel ’s active discrimination against Palestinians – not only restrictions on movement but destruction of facilities, detention without trial of players and the killing of young boys playing football. 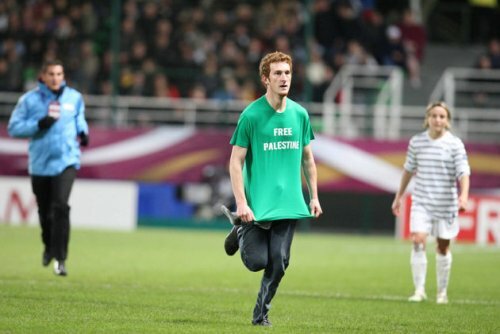 Campaigners also noted that of the grounds likely to be used for the men’s junior tournament on June 5-18, one is on land seized from two Palestinian villages, one is beside a largely destroyed village and a third is a stadium from which a Palestinian club was expelled in 1948. The protests shamed Platini into pledging to “see what he could do” about the detention for almost a year of Palestinian Olympic squad goalkeeper Omar Abu Rois and Ramallah player Mohammed Nimr. 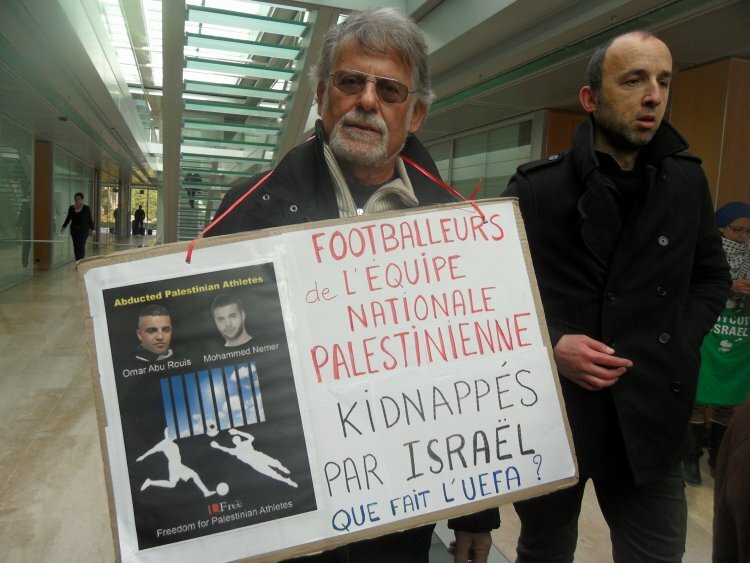 Last May, as a mounting international campaign forced Israel to release hunger striking Palestinian national team player Mahmoud Sarsak after three years in detention, Platini rebuffed calls to relocate Euro 2013 claiming Israel would host a “beautiful games”. 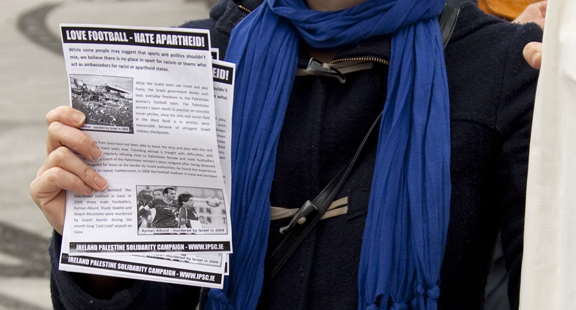 Since then support has grown around Europe for the Red Card Israeli Racism campaign which is calling on football enthusiasts who care about human rights to take the following actions in the months leading up to the June finals. 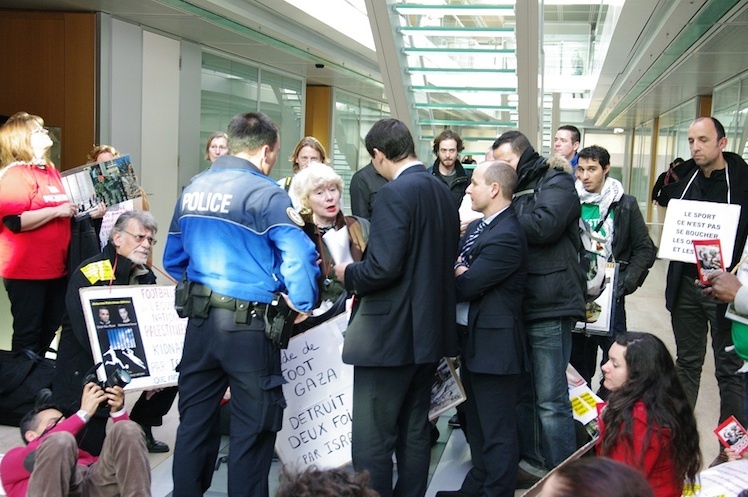 2.Video from Nyon plus links to media reports. a) Bloomfield – before Israeli forces occupied Jaffa in 1948, the ground was known as Basa (swamp) Stadium, home to local Jaffa team Shabab el-Arab. They were expelled and later formed Shabab el-Nassera in Nazareth . 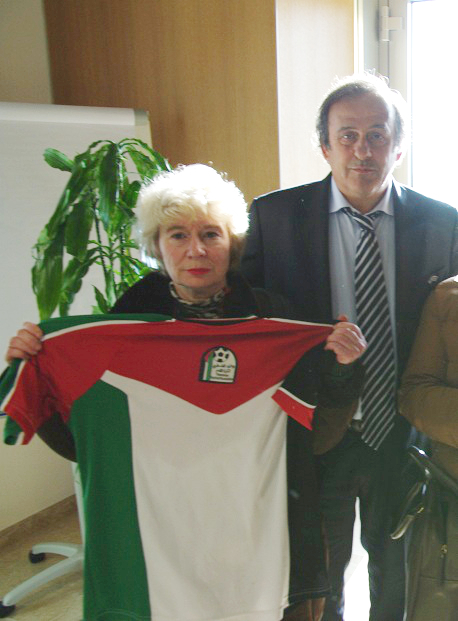 In January 1949 the Basa stadium was given to the Hapoel Tel Aviv team by the Israeli “custodian of absentee property”. b) Teddy Stadium, named after former Jerusalem mayor Teddy Kollek, is beside an almost entirely destroyed village, al-Maliha. c) Reserve stadium at Ramat Gan was built on land seized under the Absentee Property Owners Law of 1950 from the Palestinian villages of Jarisha and al-Jammasin al-Sharqi.